You are currently browsing the tag archive for the ‘Beachhamptons’ tag. 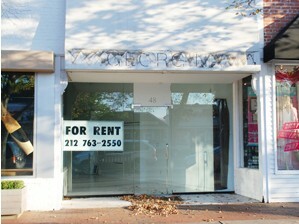 As we’ve noticed the number of empty storefronts in East Hampton Village continues to grow. I’ve been looking for a location in East Hampton for our next Beach Properties office and the asking rents have gotten up to Madison Avenue rates. $10,000 per month, triple net for a 1200 sqft raw space that needs $150,000 worth of improvements to make it acceptable as a real estate office is a bit much! That being said, I suppose the market dictates the lease rates and it’s up to us to be creative about our location choices.